John Garrity has been a member of the Providence College Faculty since 1976. In his capacity as Managing Director of Theatre he is responsible for the administration of the production programs in the Department of Theatre, Dance and Film and for theatre facilities within the Smith Center for the Arts. John has worked at the Olney Theatre Center in Maryland, at the MCC theatre in New York and has directed over 30 plays at Providence College. Some of the most recent of these include Amadeus, The Tempest, and Agnes of God. 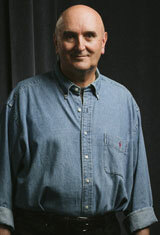 In 2006 the Masterpool Foundation established a theatre scholarship fund at Providence College in Mr. Garrity's name. John Garrity teaches Script Analysis, Directing, Seminar, and Production courses, and serves as a mentor to student directors.